New carb, new piston, bored cylinder, what could be wrong?? Thread: New carb, new piston, bored cylinder, what could be wrong?? Hey all! I feel very beaten right now I've been restoring an old 1975 Suzuki TS185 and up to this point I have replaced the carb and installed a brand new piston (which is 0.5 mm over meaning the cylinder was also just bored) but it still won't fire! I've tried choke on and choke off. I got the new piston and bored the cylinder because the compression was low but it's perfect now. I took the plug out and it's definitely sparking. I tried spraying starter fluid into the intake of the carb and it fired for like 2 seconds then died again. Does anyone have any ideas?? Maybe I need to make adjustments to the carb? My only guess would be that it isn't getting enough fluid. Last edited by diericx; 02-26-2019 at 11:40 AM. If it'll fire on starter fluid, that's a good sign that it can eventually be coaxed into firing properly. I agree with you that it may be a needed adjustment of the carb. There should be a Throttle Stop screw that allows adjustment of the position of the carb slide within the carb slide bore. Leave this one be for the time being. The air/fuel mixture screw would be the one to try first. Unless you know the ballpark setting for that screw, you can lightly seat the screw and then back it out 2 full turns. (1.5 - 2 turns out is normal for many bikes) After adjusting, try it both with choke in and then choke out to see if that gets you closer. Hey, I was wondering if I could get some clarification on that. I'm just a little confused about which is the idle screw and which is the air/fuel mixture screw. Is the red arrow the idle and blue arrow the air/fuel? 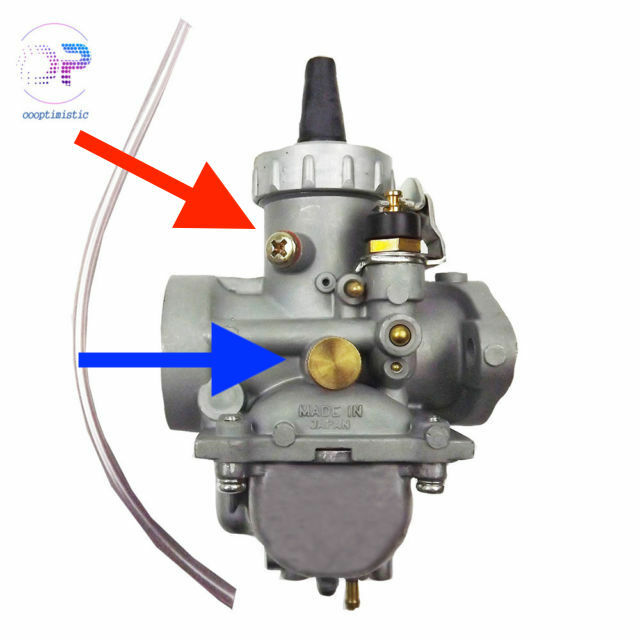 Almost positive that the blue arrow is pointing to the idle screw and the red arrow is pointing to the air screw. You might wait until Aussie Steve is online as he sure knows his way around the 2-strokes and can more than likely set you straight on this. He may have a better idea of how many turns out from seated you'll want to go. Also a chance of the float level needing to be adjusted (unknown) I'd start with the air/fuel mixture screw and move forward as needed from there. You were right! Made some adjustments and it started right up Except the red arrow was actually pointing to a screw with a gasket so it wasn't meant to be adjusted. The blue screw is the idle adjustment and on the OTHER side of the carb was the air/fuel mixture screw. Just putting this here in case anyone else runs into a similar situation, but the info you gave me was super helpful, thanks!! Last edited by diericx; 02-28-2019 at 07:56 PM. Well, you first asked if the carb needed adjustment, so from where I'm standing, YOU were right, LOL! Seriously, ya done good! If you haven't already, you should be able to dial in the carb for max efficiency. Please remember that it's best to do the dial-in when the bike is fully warmed up. Slowly turn the air/fuel mixture screw in while counting the number of turns. Turn it in while listening to the engine rpm increase. Once it starts to falter/drop off, stop there and make a note of the number of turns. Then slowly back the air/fuel mixture screw back out, again counting the number of turns while listening for the sweet rpm spot in that direction. Once it starts to drop off, stop there. Then simply split the difference between the number of turns it took going in and going back out, basically setting it to the in between/midway point. After that, you can adjust the idle screw to achieve the healthiest idle and you should be good to go. On a side note, just wondering what that other non-adjustable screw is. Interesting as I've not seen that before. Last edited by Sinical; 03-01-2019 at 01:34 AM. hahaha true! But you gave me the know how to actually do it I've already messed with the air/fuel mixture screw though, do you think I should still count turns even though it isn't how it came? Or should I just screw it in until I hear it falter, then count in the other direction and split it? Also I honestly have no idea what that screw is. It didn't seem to make much of a difference when it was unscrewed but I'll try again tomorrow and see what it does. No need to disturb the non-adjustable screw on my account. I was more thinking out loud in just wondering what purpose it serves is all. When you say "isn't how it came", do you mean isn't how it came right out of the box from the manufacturer ? If so, the manufacturer might set it at ballpark as a starting point, but with each bike running differently, some adjustment/dial-in is normally required. The technique described previously is known as the "idle drop method", seeking a healthy rpm in each direction and then splitting the difference. This provides the best setting for your individual machine and should also allow for more normal starting as well. It's your call, if you're not comfortable with it, you can always return it to the original manufacturer's setting, just keep track of how many turns have been made if you want to return to your original starting point. Another edit before getting on with the day here: Just wanted to commend you on keeping after this project. You've made considerable progress and that's a result of your well intentioned efforts. Right on! Last edited by Sinical; 03-01-2019 at 12:20 PM. Thanks man! I'm really happy about how it's turned out. I rode around all day yesterday it was so fun! I also appreciate all the advice you've been giving me it's been so helpful. I'll try what you mentioned here, but I've run into another problem... it won't cold start I left it in the garage over night, went to start it to head to class and got nothing. Couldn't even bump start it! I tried with the choke on, the choke off, giving it a little gas, nothing worked. I think it's either a setting on the carb, or the fact that I'm pre-mixing my gas and oil (I'm leaning more towards this). The bike has an oil pump that goes straight into the engine (not sure exactly where to) but mine is broken so I've been mixing. Do you think this could be making it harder for the gas to ignite? Last edited by diericx; 03-01-2019 at 09:14 PM. Do you have a work shop manual for the bike ? If you're pre-mixing gas/oil using the proper amounts of each, that shouldn't be the issue. Since you live in the Mile High City, yes, it's possible that a re-jet is needed. One of my cousins lives in Denver and spent a Summer in New England. He had his bike with him and had to re-jet. That was many years ago and I honestly can't remember, but he "might" have re-jetted one size up. In your case it would probably be a re-jet down in size, but I'm not convinced that that's the problem, either. With having to keep using starter fluid, that indicates that the carb isn't adjusted right yet. Whenever parking the bike, it's highly recommended to turn off the petcock. Very important. No need to clear the fuel, simply turn off the petcock. Yes, it could be getting flooded, are you smelling fuel ? but am more inclined to think the carb needs adjustment. If you've got the manual, you might check the measurement for the float level. And once running again, you might want to try the idle drop method (with bike fully warmed up) to see if that resolves the prob. You bought this bike as a non-running project, yes ? Did you clean the gas tank as well as the petcock ? If there's a lot of sediment in the gas tank, it could clog the petcock and restrict the flow of fuel. In your Edit2 and adjusting the screw with no effect, was that the non-adjustable screw or the air/fuel mixture screw ? If it was the non-adjustable one, no worries (unless it actually CAN be adjusted, LOL!) If it was the air/fuel mixture screw, not sure why it didn't change anything, but please remember to never tighten that screw beyond "lightly seated" as too tight can damage the tip of the mixture screw. And while on topic, have you lightly seated the air/fuel mixture screw and then backed it out by 1.5 - 2 full turns as a starting point ? Last edited by Sinical; 03-02-2019 at 01:49 AM. I definitely smell fuel when I'm trying to kick start the bike, and yes I got it in pretty bad shape but it was running. I haven't cleaned the petcock and it's definitely leaking a bit but the fuel line stays consistently full so it should be getting enough fuel right? I'll try to mess with the screws again tomorrow, but I've done everything you've said (seated, turn 1.5-2 turns out) and messed with the idle screw getting it just good enough to idle but there doesn't seem to be any effect from the mixture screw... but maybe my idle is set too high right now. Last edited by diericx; 03-02-2019 at 04:25 AM. Understood on the gas tank, petcock, fuel delivery. Wasn't sure if it was a runner when you got it and trying to cover all the bases. Sounds like you're good to go in that area. Very good point you make about the idle possibly being set too high. When doing the idle drop method, it's routine to lower the idle some temporarily while making the adjustments as it allows one to hear changes better when turning the air/fuel mixture screw and then re-setting the idle once done. I probably should have mentioned this earlier but didn't know where the idle screw was set to begin with and didn't want to confuse the issue. My bad, but you're good at thinking things thru (which is great) and you're on target. Just another aside here.........if you don't have the work shop manual, it'd be a good investment. The manual for one's bike is one of the most valuable tools in your shop. I routinely score as many manuals as I can find for each bike owned. Factory OEM, Clymer's, Haynes, Chilton, etc. The parts manual can also be extremely helpful as it shows not only the right part #'s when needed, but can give insights on how everything is interconnected when checking out the exploded diagrams.